The authority a user of a computer program or a network has to access that program or network. One using a program or network without access rights is a hacker. on parcel A. 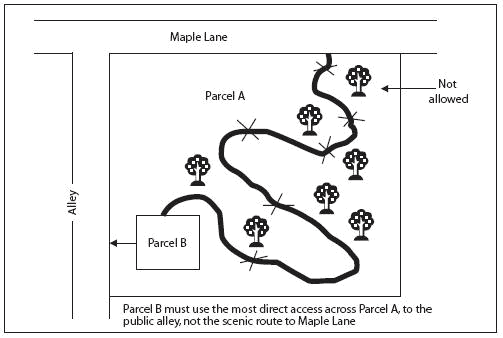 The owner of parcel B may not force the owner of parcel A to provide a scenic route. However, 15 per cent admit access is not really controlled and 11 per cent say they are unable to detect sharing of access rights. Through the definition of access rights, a source defines the participation level it will have in the federation, not only defining the exports the schema to share but also the access rights who have the federation over each schema element. Louise Smith, aged 35, who lives at Yarningale Lane, with her husband David, aged 40, and their five-year-old twins Ian and Callum, said she was outraged when a letter arrived from the parish council, demanding pounds 60,000 for access rights. Since a map of the relationships between each of the users would look like a spider web, the administrative job of giving access rights to some workstations and not others would be far more difficult with NT than with NetWare. Negotiation of access rights is a different set of skills than buying books, periodicals, and microforms. Distribution in an electronic environment, or will there be libraries as we know them in the Internet world? The process of checking access rights is very fast: opening a wireless lock with ShareKey takes less than 500 milliseconds. On September 19 open access rights will be granted in the South-East and lower North-West regions of England under the Countryside and Rights of Way (CROW) Act. ConfigSENTRY lets customers define user groups with different privileges and access rights for groups of devices. NASDAQ: WCII) has obtained access rights to more than 4,200 commercial buildings nationwide, and has signed an agreement with Spieker Properties, L.
The City Council voted unanimously Wednesday to take access rights to the arroyo's southern bank near Liberty Bell Road, close to the spot where Joel Burchfield died while taking a shortcut through the rain-swollen creek. Using Aveksa Compliance Manager, the company will achieve unmatched visibility into the true state of user access rights for risk-relevant applications and dramatically simplified reporting for continuous compliance. This system comprises - Standalone digital cylinders- Linings may be mounted on all the doors without laying cable,- Readers table for updating access rights,- A scheduler,- Software for centralized management of access rights.